I have a collection of favorite recipes that I’ve been gathering over the years. If I try a new recipe and it’s a hit with my family, I add it to the favorites. I’ll show you how I organize my “recipe’s to try” in another post. Up until now I’ve used a recipe box to organize the recipe cards. I showed you that box quite a while ago. It’s worked well, but I’ve been wanting to update and change the cards and organizer for a while now and I finally got it done. Well, I can’t say it’s completely done, because I still have to finish typing all my recipes, which takes a while, BUT I just keep doing a little at a time. Eventually I’ll get them all typed up and added to my new binder. I created a side label for the binder too. Inside my binder looks like so. I printed and laminated each dividing page and popped holes in the pages with a hole puncher. I put a matching weekly meal planning page, attached with a binder clip to the inside of the front cover. This one is also laminated and I just write the menu out for the week with a dry erase marker and wipe off to update it for the next week. You may remember the other weekly meal planning printable page that I had in my all-in-one family binder. I’ve used that, until I decided that I would rather have the meal planning along with my recipes. (I just didn’t want you thinking that I’m doing both.) Organization in this household is always changing. The inside of the binder is organized by section. boil coffee, sugar and water. in a large jug or bowl, add ice-cream, creamer, ice and milk; then mix coffee, sugar and the water into the jug. ENJOY! Inside each section, I’m using 4 x 6 photo sheet protectors to hold my recipe cards. I purchased the protectors at Staples and I really like the fact that my recipe cards are protected from food splatters. I created three different edit-able 4 x 6 recipe cards. When I get a moment here and there, I sit and type a few recipes in the cards, print them onto cardstock, cut them out and place them into their proper section in the binder. It’ll take me some time to get them all typed up, but my plan is to have all our favorite recipes typed and in the sheets soon. Each listing is separate and you get 2 total files. One PDF file that you can type in (or cut and paste) your favorite recipe and you also get lined cards as well. I keep a stack of lined cards in the back of my binder, in case I have to quickly jot down a recipe to add. 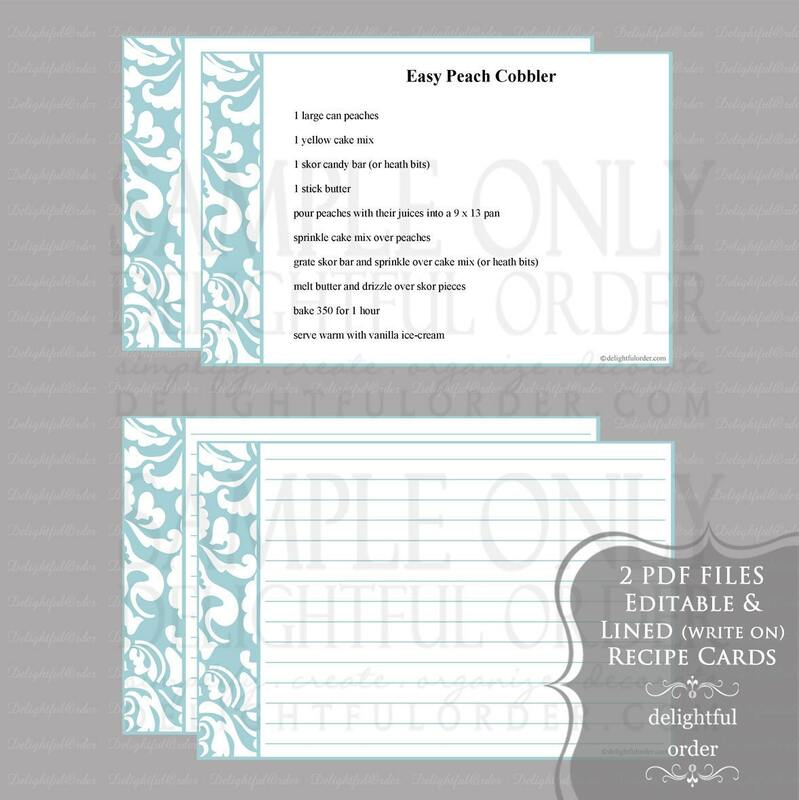 I chose to use recipe cards vs. full 8 1/2 x 11 pages, because I tend to change things around quite a bit and if I ever decide to go back to a recipe box, I can simply transfer the cards from the binder to a box. Also included in the printable recipe binder organizer packet are tabs for each section. I cut the tabs out, laminated (which you wouldn’t have to) folded the tabs, and stapled them to the 8.5 x 11 sheet. For a little added detail, I popped a hole in the tab and put ribbon through each one. I use this cheapo stand to hold the binder up while I’m cooking/baking. It sits on my counter for easy viewing. I’m so glad to have this binder (almost) done. Today, I think I’ll type up a couple more of our favorites to add. Create a favorite recipe binder for yourself or for a friend, mom, co-worker, bridal shower or wedding gift, etc. This would make a GREAT gift for anybody! 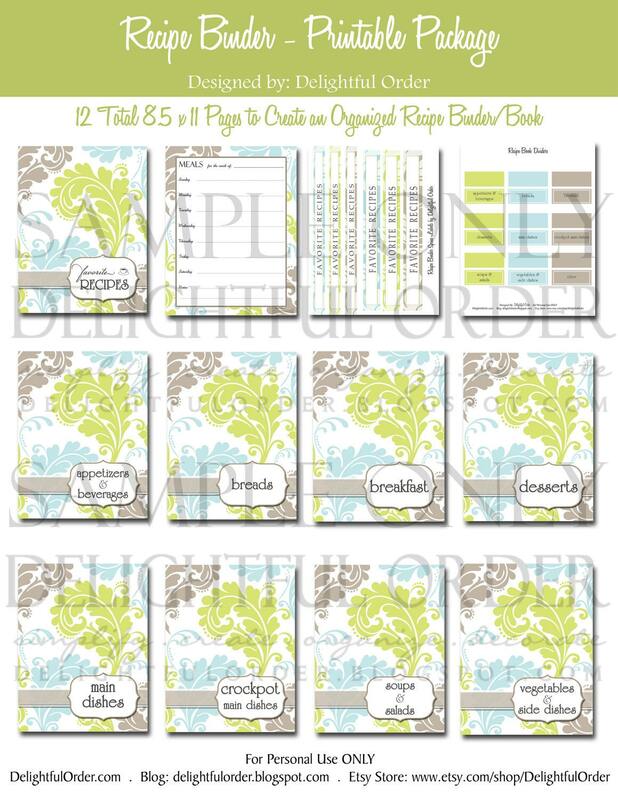 AND you can print the printable pages as many times as you'd like, so you can create organized recipe binders as gifts (FOR personal USE only) as many times as you'd like! Wow. I absolutely must do something like this. I have all my favorite recipes on little torn up sheets, or I just hope to remember where the webpage I found it on is the next time I want to make it! This looks like it would be so fun to use! I've been using a binder for recipes for a couple of years now. One thing I did, was used page protectors and index tabs, I cut a slit in the page protector so the index tab would stick out further than the other pages. Using the page protectors makes it EASY PEASY to simply print a recipe from the internet and just slip it in a pocket. Your design is incredibly cute though! Love it. I do the same thing with my recipes to try ;) and your right it does make it easy peasy! That post is coming soon. WOW!! This is a beautiful binder, I love how you organized it. Very, very nice! Well done and lovely! This is too cute!!! Very well organized and your print is gorgeous! I really like this. I have so many recipes that I've cut out from magazines that get wrinkled, crumpled, etc. over time. This would be a great summer project! Love this, you did a great job and I love the subtle colors that you used! What a wonderful undertaking and I think the set is just beautiful! I love the little tabs with the ribbon too and the fact that the recipes will stay nice and clean! I'm thinking this is a great Winter project -- pinning! I absolutely live this. I have a whole drawer of favorite recipes that would look great in this book. Found your blog via Pinterest and just purchased this set and the coordinating circle labels/tags. I'm super excited because I just redid my kitchen in these exact colors. Thanks for making awesome products and for sharing all your amazing organizing tips! I have come back to this time and again! I can't wait to get my recipe binder all set up!! I was curious what program you made your pages in? Thanks for some great inspiration! !